I adore Gazpacho. It's the one dish I always look forward to on holiday in Spain. Cold tomato soup may not be everyone's cup of tea but when it's made well, with quality ingredients, it's wonderfully flavourful and refreshing dish. In a similar vein my tipple on a plane is always a Bloody Mary. I'm not quite sure why, but ordering one always mean that I'm off on holiday. 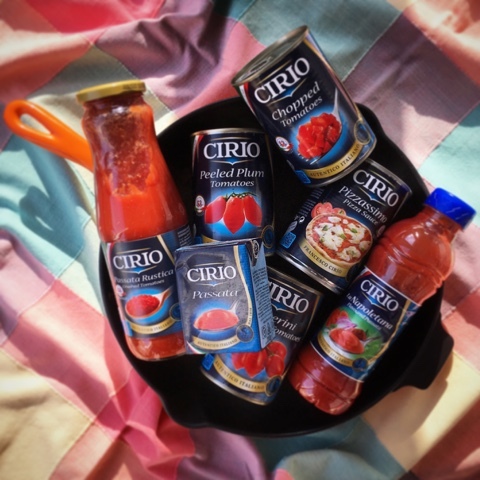 As part of my ambassadorship with premium Italian tomato brand Cirio the blogger brief talks about 'new and different ways to use Cirio'. I reckon the recipe that I've created for them today does just exactly that. 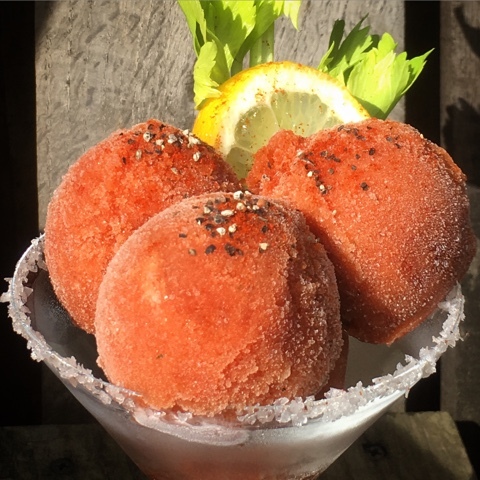 Tomato Gelato aka Bloody Mary Sorbet. If you are turning your nose up in disgust don't diss it until you've tried it. The sweet/savoury/icy combination really does work. And the generous shot of vodka in there is an added bonus. If you're a Gin fan like myself feel free to substitute your spirit. 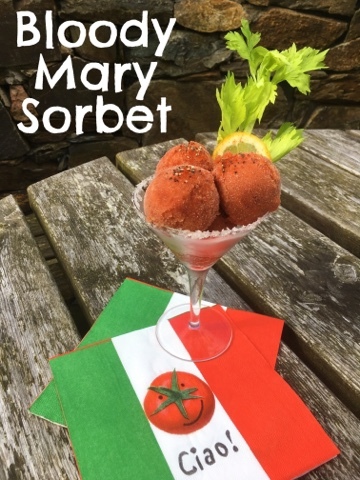 Likewise a Virgin Mary Sorbet will taste almost as good. It can be served as an amuse bouche, starter, palate cleanser, desert or cheeseboard accompaniment. I reckon it would be great as part of a prawn cocktail and downright awesome to put a scoopful in the middle of a bowl of Gazpacho. If you want the ultimate grown up 'Slush Puppie' just let it defrost a bit and serve with a long spoon and wide straw. The possibilities are endless! 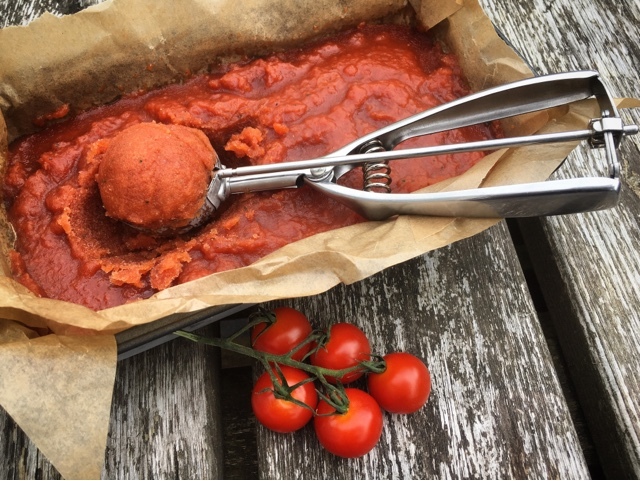 I used a bottle of Cirio La Napoletana Flavoured Passata which contains 100% Italian tomatoes crushed and enriched with a blend of onion, celery and paprika. 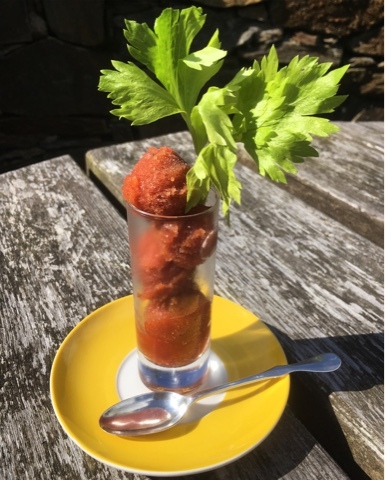 How spicy or mild you make your Bloody Mary Sorbet is entirely down to personal taste so feel free to revise the quantities of Tabasco up and down according to your own eat tolerance. Put the sugar and water in a small pan, turn up the heat and boil for 5 minutes until syrupy. Leave to cool completely. Meanwhile roughly chop the cucumber, pepper and shallot and whiz them to a pulp in a food processor. 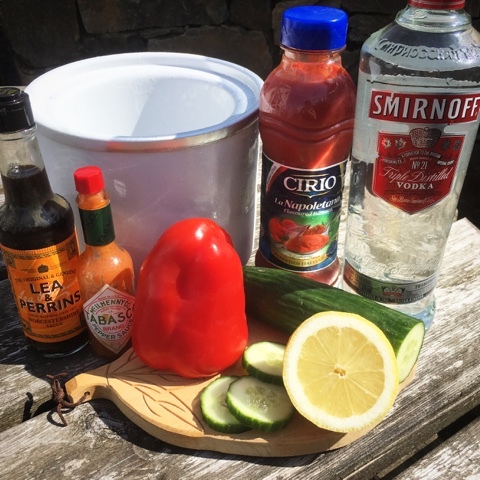 Add the Cirio La Napoletana Flavoured Passata, vodka, lemon juice and cooled sugar syrup and blend until combined. Taste and season with the Worcestershire Sauce, Tabasco and Black Pepper. Push the mixture through a sieve into a large jug. Churn the sorbet in an ice cream maker according to manufacturers instructions. Take the sorbet out of the freezer and allow it to soften in the fridge for 10 mins before serving in salt rimmed glasses. Garnish with celery, lemon, freshly ground black pepper and paprika. 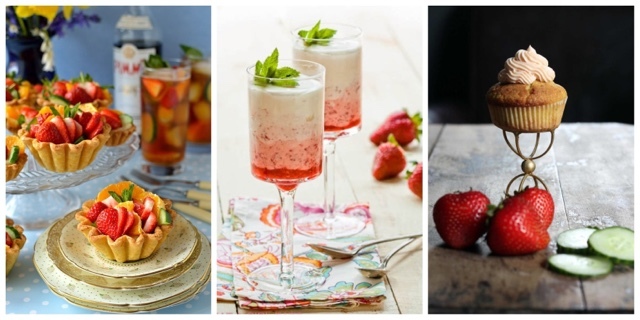 Now that you've dragged the ice cream maker out of the back of the cupboard and dusted it off, why not make it earn it's keep and churn up some more refreshing sorbets? 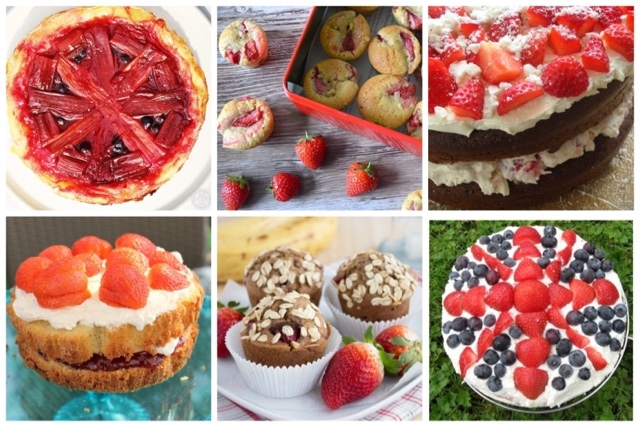 Recipes below are from some of my food blogging colleagues. Wimbledon kicks off today. A quintessential British sporting event for which I'm always very excited. Alas I've never been to SW19, but as a proud Scot in recent years I've watched avidly the progress of Andy Murray. As French Open runner up and winner at Queens he's surely in a great position in 2016 to repeat the success of 2013. I suspect that my love for Tennis came from my youth when I used to come home from school in the 80's and find my Mum watching Jimmy Connors, John McEnroe, Bjorn Borg and the likes with great enthusiasm. As a teen I was a fan of Stefan Edberg and Pat Cash. Admittedly that was probably as much for their looks as their tennis! I also remember making my Mum buy multiple of bottles of Robinsons Lemon Barley Water so I could collect tokens and send off for a Wimbledon Towel! It was worth it though as 30 years later I still have it. At this time of year whether its due to Wimbledon or the warm(er) weather, both adults and kids seem to feel inspired to pick up a racquet and play tennis. 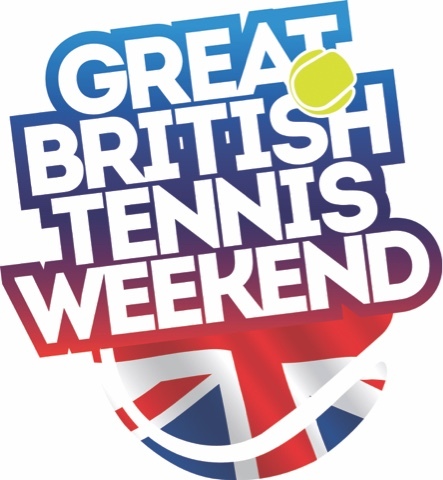 I’m currently working with the Lawn Tennis Association on their Great British Tennis Weekend campaign #GBTW. Across the weekend of Saturday 16th & Sunday 17th July you can try tennis for free at a Great British Tennis Weekend event. Sign up for your FREE tennis activity here. Simply enter your location and find and book a session. Thousands of free events will be taking place all across the country, with sessions to suit the whole family. 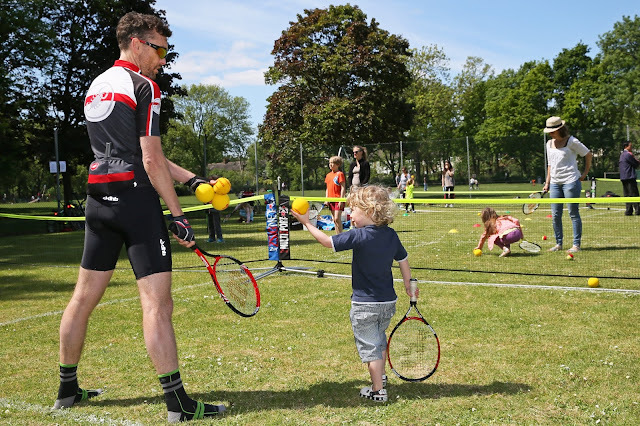 There are Highland Spring Mini Tennis sessions, family time, free play, Cardio Tennis and numerous other kinds of activities to get involved in. Rackets and balls will be provided, so whether you’ve never picked up a racket before or you’re a seasoned regular – there is fun to be had. My own playing experience is somewhat limited. As a child I remember my Auntie Joyce getting very enthusiastic with a serve always proceeded by the question "Is your bat ready?". We're lucky enough to have a couple of courts in our village and a quick knock about is a fun way to encourage kids to get outside, have fun,keep fit and perhaps find a future British tennis star. 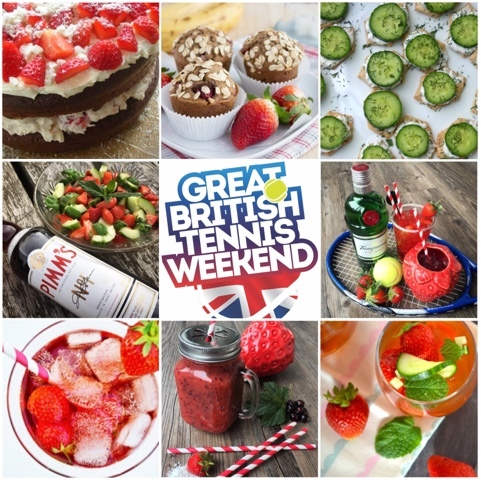 If you've not been lucky enough to get tickets in the ballot why not try tennis for free this summer by signing up for a #GBTW session and preparing your own Wimbledon inspired feast with the help of the recipes below. 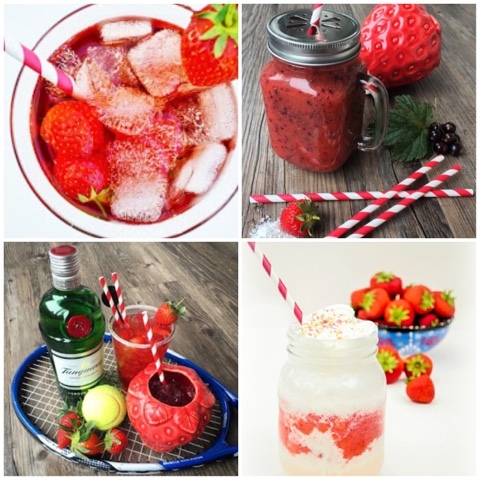 Disclosure : This is a commissioned post for BritMums and the Lawn Tennis Association. I’m working with the Lawn Tennis Association on their #GBTW campaign. Sign up for your FREE tennis activity here. I love sushi. I love eating it and I love making it but if I'm honest it's a wee bit of a faff to prepare. How about all the amazing flavours and textures of sushi without any of the hassle, rolling, raw fish and tricky time consuming bits? 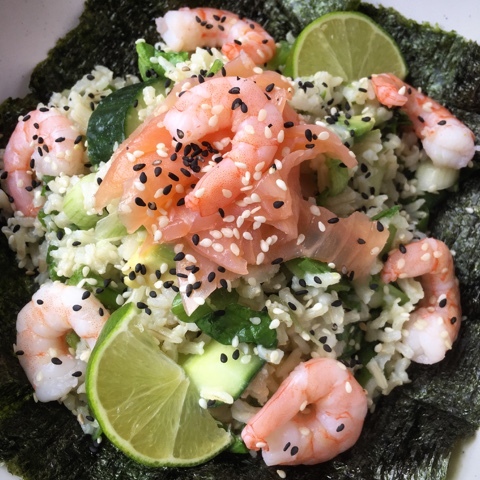 That's what the Smoked Salmon and Prawn Sushi Rice Bowl recipe that I'm sharing today will give you. It's based on my recollections of a dish that used to be a favourite of mine on the menu at Giraffe a number of years ago. I guess you could call it deconstructed sushi. All the elements are there, just not in quite the traditional way. I'm not sure if I've managed to accurately remember all of the ingredients that were in the Giraffe version that inspired this creation, however it's the general concept that's important. 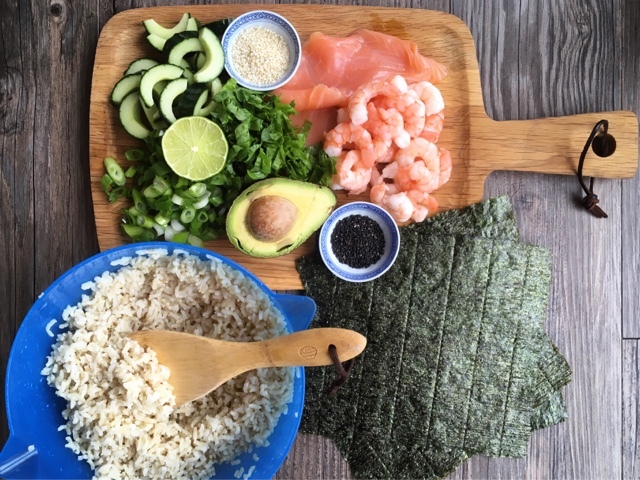 Line your bowl with nori and pile it up with sushi style seasoned rice. Go heavy on the Wasabi if you like a bit of a kick. Talking of which I'm kicking myself for not adding edamame beans to mine. Next time I make this they will definitely feature. Cook the brown rice in boiling salted water according the the packet instructions until tender. Allow to cool. This process can be speed up by rinsing and refreshing in cold water. Whisk together the sushi seasoning and wasabi paste to make a dressing. Stir this through the cooled brown rice. 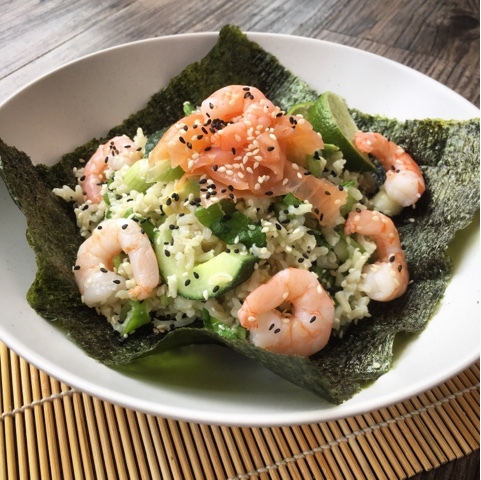 Combine the seasoned rice with the cucumber crescents, cubed avocado, sliced spring onion and shredded baby spinach leaves. 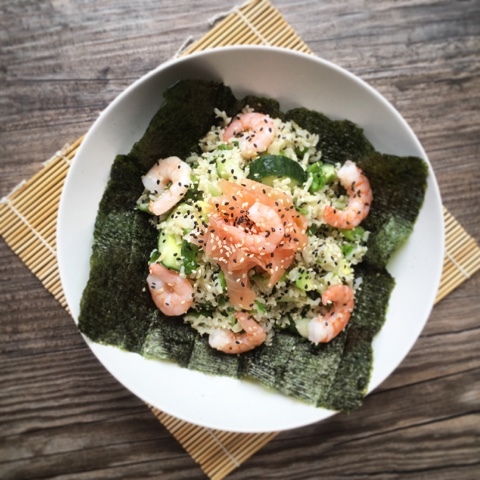 Line four 'pasta bowl' type dishes with a sheet of nori and divide the rice equally between the bowls. 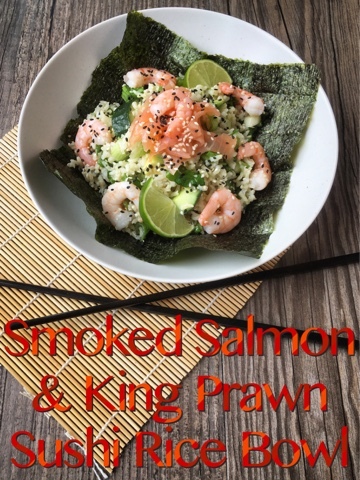 Top the mounds of rice with the kings prawns and smoked salmon. Sprinkle with black and white sesame seeds. Garnish with a wedge of lime and serve with soy sauce and chopsticks. Got the rice bowl bug? Check out the recipes below. Everything tastes better when served in a bowl! Growing up there were really only two options when it came to individual frozen treats. Ice Poles or Choc Ices. Now there are a myriad of choices to suit each and every taste. 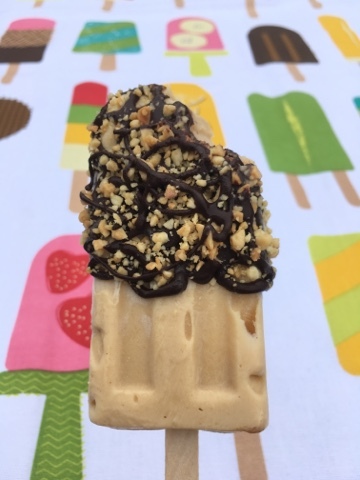 I very much doubt that kids of today would be impressed by a Choc Ice but I remember being allowed to have one from the depths of the chest freezer on a hot summer's day as being a real treat. 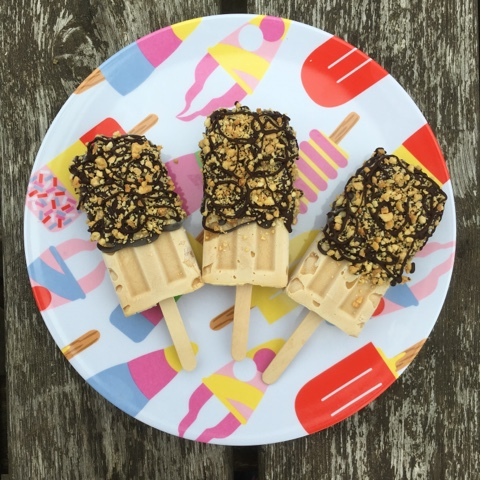 Perhaps because there is so much choice available these days I've never really got round to being very adventurous with making my own ice lollies and up until now I've really only made very basic ones using squash and the lolly moulds with the built in plastic sticks. Spotting some of my fellow food bloggers wonderful ice pop creations on social media spurred me on to have a try at making some of my own. On a trip to TK Maxx I'd picked up a silicone mould for making traditional ice lollies with proper wooden lolly sticks and felt it deserved something better than diluting juice. 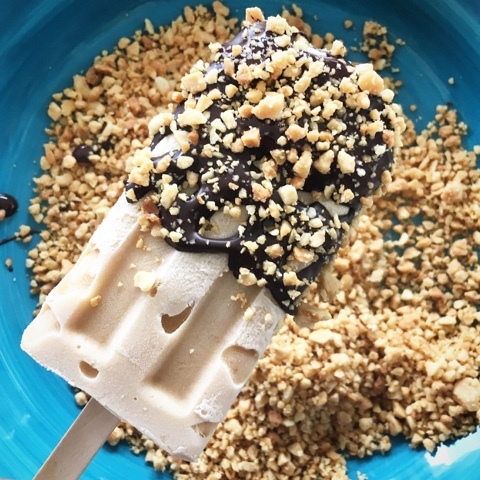 I'm a sucker for all things Peanut Butter and have been loving the limited edition Muller Light Peanut & Caramel Yoghurts so decided to use one as the base for my creation. 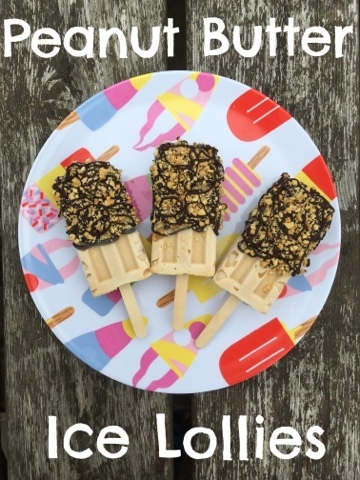 The resulting lollies taste great 'naked' but I decided to take inspiration from Magnum and Feast and decorate with dark chocolate and chopped nuts. Whisk together the yogurt, custard and peanut butter until smooth and thoroughly combined. 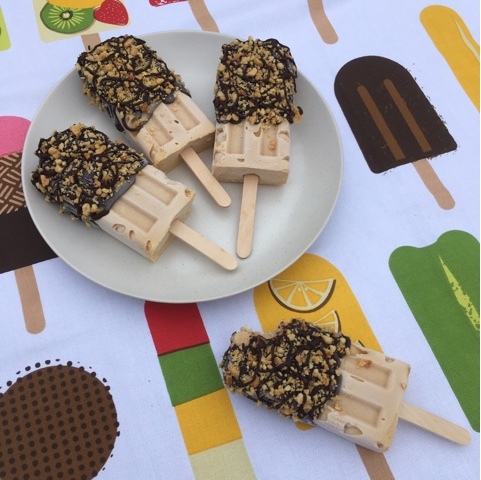 Pour into ice lolly moulds, insert sticks and freeze overnight. 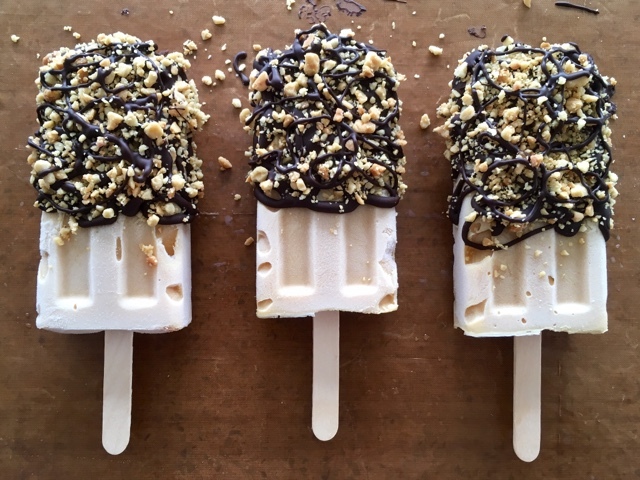 Melt the dark chocolate and pour into a disposable piping bag. Finely chop the salted peanuts. Dip the moulds in hot water for a few seconds to help release the lollies. Place the lollies on greasproof paper/reusable non stick liner. Snip the very tip off the piping bag of melted chocolate, drizzle over the end of the lolly, then sprinkle over the chopped nuts. You'll need to work quickly! Eat immediately or return to the freezer and wait for a sunny day. This week is National Picnic Week although I suspect someone may have forgotten to tell the weather. It's been somewhat soggy and driech, certainly in my wee corner of Aberdeenshire. If things are looking brighter where you are it's a great opportunity to fill a flask, dig out the wicker picnic basket and tartan travel rug and set out on an edible adventure. 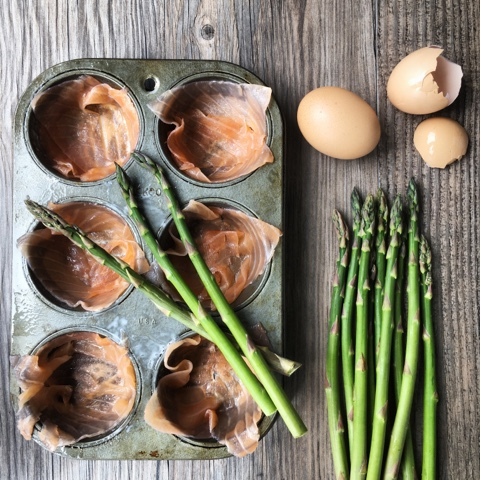 If the weather really doesn't want to play ball the recipe that I'm sharing today for Smoked Salmon and British Asparagus Mini Crustless Quiches makes a perfect packed lunch or light supper. And for anyone following Slimming World these tasty morsels just happen to be Syn Free. Its nearing towards the end of the short but sweet British Asparagus season and I've been indulging in the tasty green spears on a very regular basis. Alongside salmon and egg they really are the most perfect of flavour combinations. 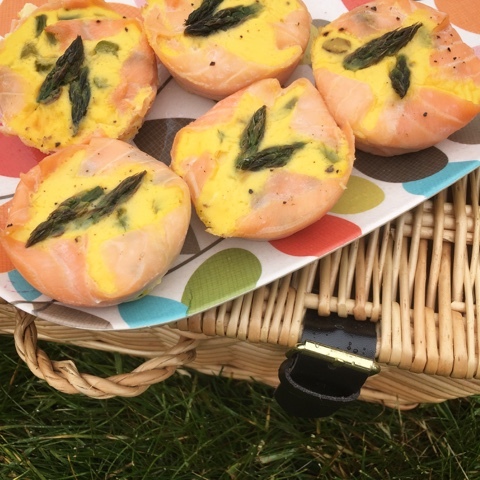 To line my mini quiches I've used squares of smoked salmon which are sold as sandwich slices.These are the perfect size for a muffin tin but if you can't track any down you can instead jigsaw together regular smoked salmon to do the same job. 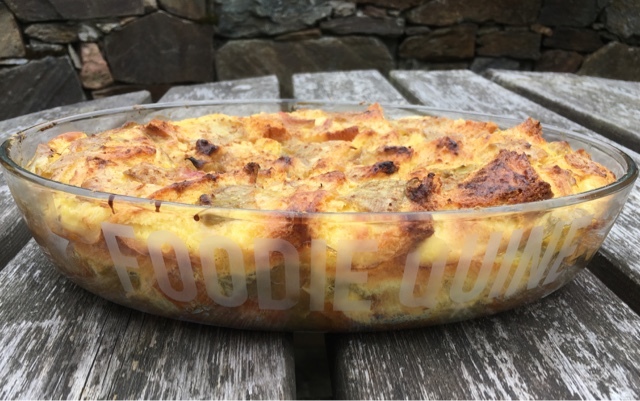 I cook these in a very simple bain marie which stops the edges overcooking before the centre of your mini crustless quiche sets. Spray the indentations of a 6 hole muffin pan with Oil and line each hole with Smoked Salmon. Cut the tips off your Asparagus Spears and set them aside. Slice the stems of the Asparagus into 1cm lengths and saute them in a frying pan with a squirt of spray oil for 5 minutes. Whisk together the Eggs and Quark and season with freshly ground Salt & Pepper. Divide the sauted Asparagus equally between the 6 mini quiches and pour over the egg mixture. 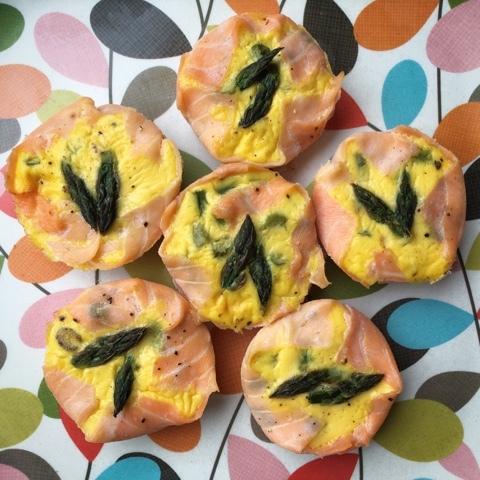 Top each quiche with two of the Asparagus Tips and fold in any overhanging salmon. Use a roasting tin, large enough to sit your muffin tray in, as your Bain Marie. Half fill it with boiling water and place the muffin tin into it. Cook for 20 minutes or until the egg is set. 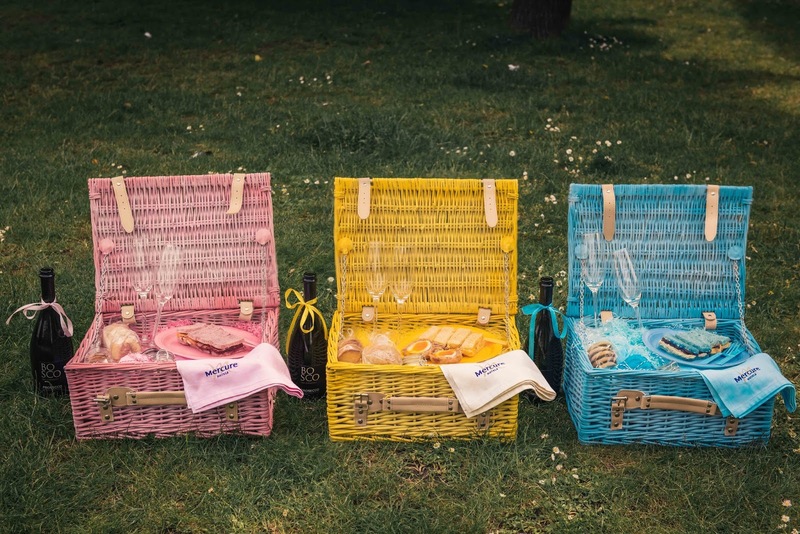 If you fancy a picture perfect picnic without the hassle of creating it yourself, the three hampers being launched this week by Mercure Hotels will be right up your street. 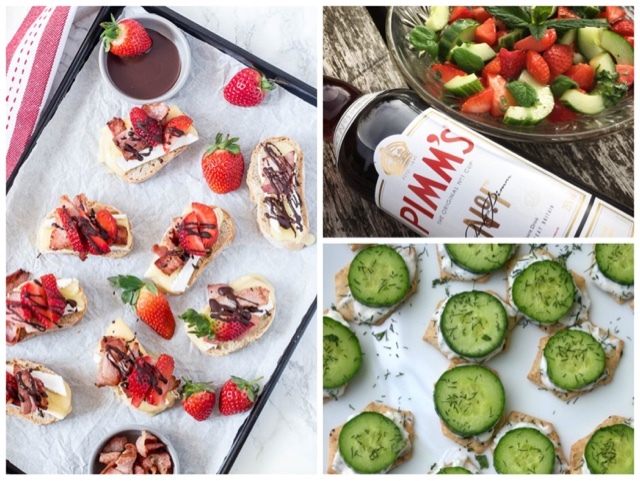 The classic British pastime of picnicking is brought slap bang up to date with a bespoke range of ‘Pre-Instagrammed Picnic Hampers’ combining our modern obsession with uploading foodie phots to social media, with the age old passion for al fresco dining. There have been almost 300 million (and counting) food posts on Instagram since its launch in 2010. At the moment I'm responsible for 2612 of them! The three hampers, created in partnership with contemporary food designers, Bompas & Parr, have been designed to fit the style, shade, and colouring of the UK’s favourite Instagram filters - Mayfair, Hudson and Juno. The vibrantly coloured hampers feature beautifully created, totally bespoke food, with locally inspired ingredients from selected by Mercure hotels, including Ardoe House Hotel just down the road from me in Aberdeen. The “Pre-Instagrammed” picnic baskets will allow you to snap a perfect picture shot that doesn’t need to be filtered or adjusted; tapping in to the growing trend for #nofilter food photography. You'll be sure to get maximum likes, shares, comments and taste! Disclosure : I have received compensation from Mercure by way of a hotel stay in return for this post. All views expressed are my own. I'll pretty much always opt for a starter over desert. The exception to this would of course be Cheese. There are however a couple of ingredients that if they feature in dessert menu can lure me over to the dark side. One is Peanut Butter and the other is Rhubarb. Over the years I've had mixed success with growing my own Rhubarb. I barely got enough for a single crumble until a garden redesign meant that I had to uproot and relocate my plant. All of a sudden it began to flourish and there was no stopping it. 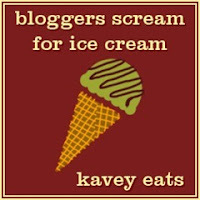 One of my most popular blog posts combines it with one of my other loves. Yup it's Rhubarb Gin. 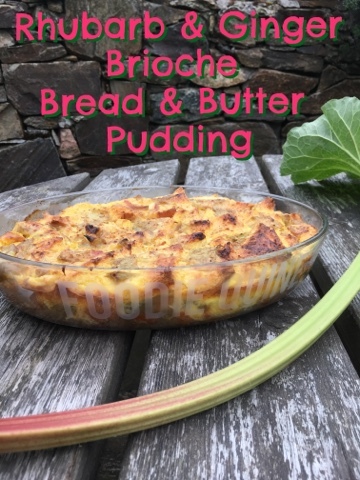 The recipe I'm sharing today is a fabulous seasonal pudding, perfect for Sunday Lunch. Traditional comfort food with a twist. Ideal served with Ice Cream, Custard, Pouring or Clotted Cream. Cold leftovers are great for breakfast. Don't judge me. 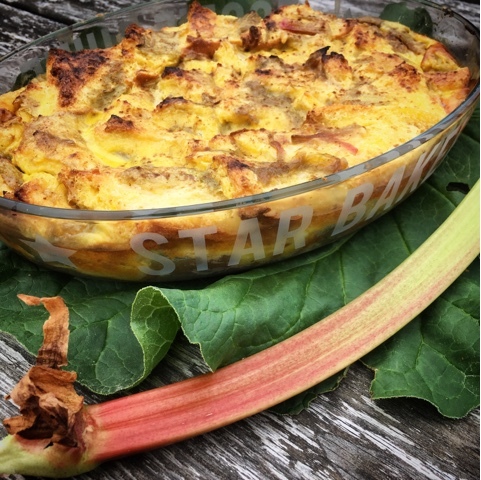 Rhubarb and Ginger is just one of those match made in heaven flavour combinations and my Brioche Bread & Butter Pudding was the perfect Star Bake to try out my gorgeous personalised Pyrex Dish from Becky Broome. Isn't it fab? 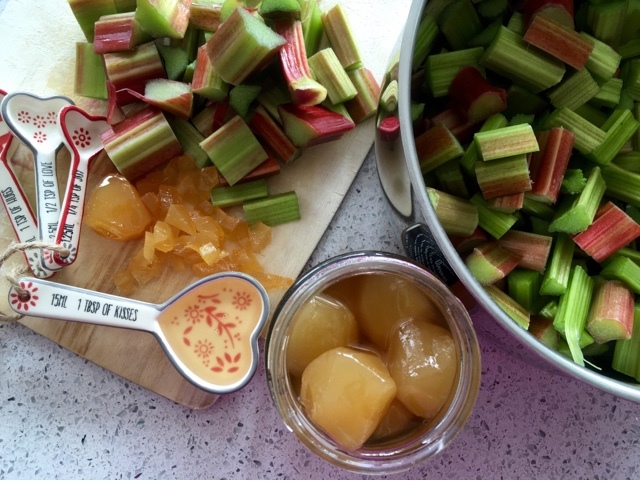 Wash the Rhubarb and cut it into 2-3cm lengths and place in a saucepan. Finely chop the Stem Ginger and add to the pan along with the Caster Sugar and the Stem Ginger Syrup. Simmer gently for 10-15 minutes until the fruit is soft. Allow to cool slightly. Place half of the Rhubarb and Ginger mixture in the base of an ovenproof dish. Spread the remaining fruit mixture over the slices of Brioche and cut each slice into four triangles. 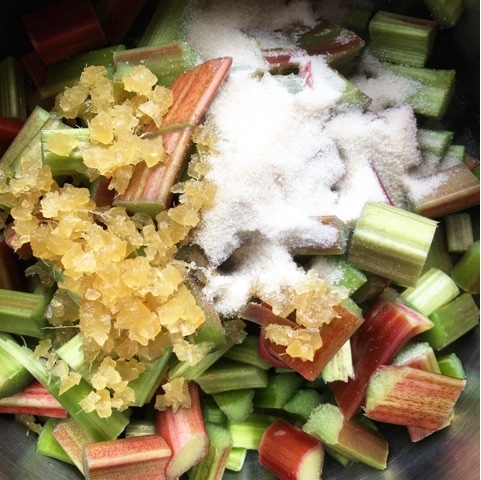 Arrange the triangles of bread, jammy side up, in an overlapping layer on top of the rhubarb. Whisk together the Cream, Vanilla Extract, Caster Sugar and Eggs together and pour over the dish. Sprinkle with Cinnamon and cook for 30-40 minutes or until the custard has set and the top is golden-brown. A quick impromptu recipe today. 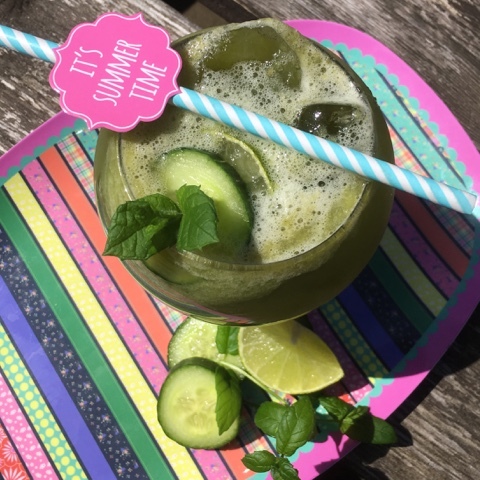 I was going be sharing a rather stodgy desert but instead came up with a refreshing juice to match the wonderful sunshine. Of course it's important to stay hydrated in the heat and whilst I'm as partial to a summer cocktail or glass of Pimm's as the next person, folk start to talk if you have them for breakfast! 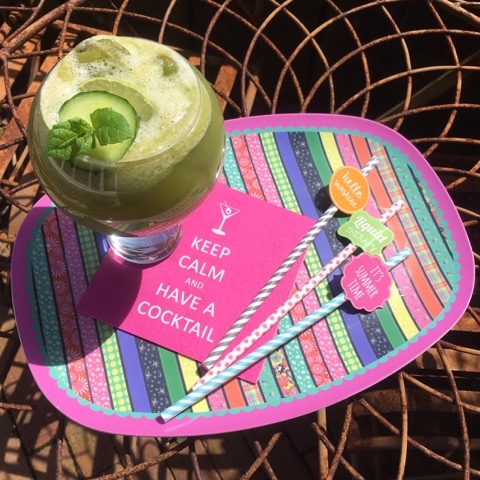 As an alternative today I used my Optimum 600 Cold Press Juicer to make a Sparkling Mojito Mocktail. All the flavours of the real thing but none of the alcohol and definitely counts towards your 5 a day. Cheers! 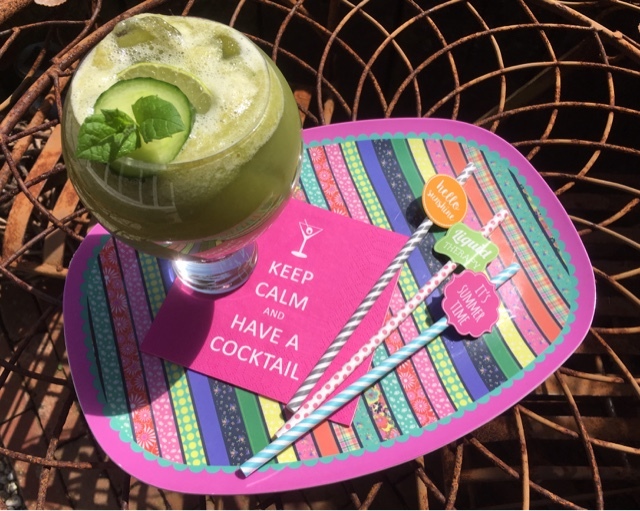 Juice the apple, cucumber, pear, lime and mint. 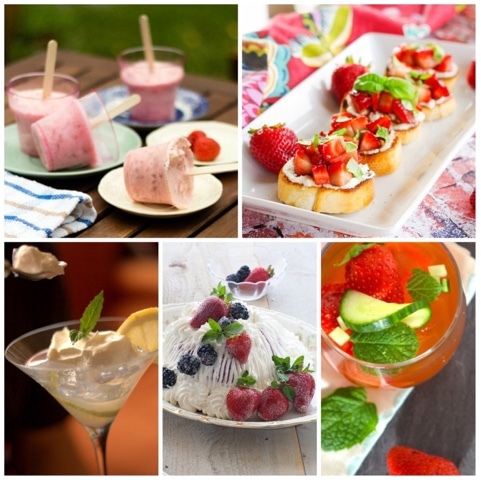 Once done pour over ice, top up with sparkling mineral water, garnish and enjoy! 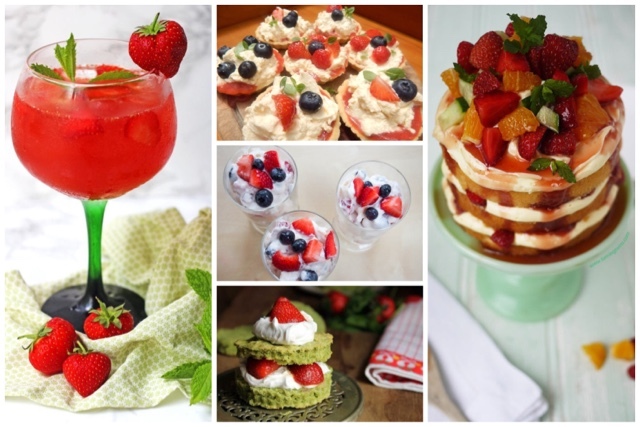 Disclosure I am an Ambassador for Froothie and the links in this article are affiliate links which means that if you buy a juicer through them I will earn a small commission.